The tragedy in Haiti has been tough to witness. I visited Haiti in my early twenty’s for a mission trip and was moved by the people that I met and ministered to and with. I remember being struck that it was not like anything I had ever seen. 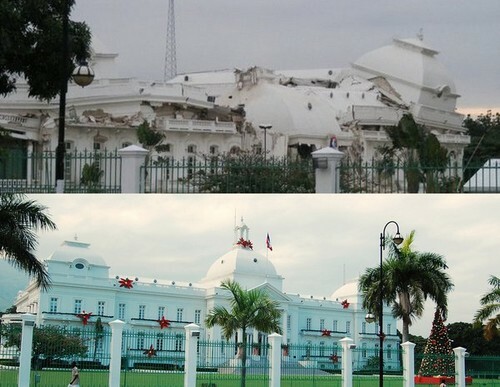 I remember going to the market in Port-au-Prince and seeing the Presidential Palace. To see it in ruins is heart breaking. Even more disturbing to me though have been some of the comments that have been in the public forum about God’s hand in all this. There have been people claiming to know the mind of God and even more specifically to know God’s mind towards the Haitian people. To say that God is punishing Haiti for the sins of their ancestors is really appalling in my opinion. It is logic like that that allows people to sit in their glamorous homes and not be moved by the plight of the poor. “They deserve it, it is their punishment,” or “they don’t have to live like that, their choices keep them there”. There are over 2000 verses in the New Testament alone dealing with the neglect of and caring for the poor and yet many are never moved to do anything to help those that are in need. When we hurt, God hurts with us. God never promised our lives would be free of pain or trial. In fact there is much more evidence to the contrary. Looking at his disciples we can see that all were persecuted and died martyrs deaths as they followed their faith. It seems evident to me that no matter what happens in life, we will experience grief, pain, and hardship. God’s promise to us is that we will not go through it alone and that he will not allow what the enemy intends for evil to succeed in the long run. Even in tragedy, God will bring something beautiful from the ashes. In this horrible time, God’s love will be seen and known in the midst to bring strength and peace to people who are hurting. Will you find a way to be a part of what God is doing to minister to the people of Haiti?